i've gotten sucked into watching 'Finding Bigfoot'... there is a marathon on today that i want to watch. my poor husband! the people act so silly, it's mind blowing. they never find any actual evidence... and even if there was evidence to find, everybody runs around stopping through the forest and being REALLY loud. they have a guy named Bobo (BOBO?!) who always pretends to be a Bigfoot (Wood Booger, Sasquatch, etc...), he's quite the goober. i also don't understand why they use their personal physical capabilities as a litmus test... Navy Seals, Army Rangers, athletes, movie stuntmen are far more agile and strong than these people! also, wolf sightings in the wild are rare, they don't want to interact with people... however, they do get seen and documented! i find it hard to believe there is something that large that there is no documented evidence to support, BUT, i am the first to admit i could be wrong :) at least these guys don't get scared, there is one ghost hunter that gets terrified and hot foots it out of scary places... you need a new job, buddy! i don't watch the ghost ones usually... i tend freak myself out (geek, right?). last up of the Juleps for this month is Jodie... and she is a beauty! a rosey pink shimmer (you can see some brushstrokes, but i feel most shimmers have those) with warm undertones. outside it is absolutely stunning, there is absolutely no justice done in viewing this polish inside... my swatchie can't do it justice either. it's like the shimmer in the photo is on steroids in the sunshine! 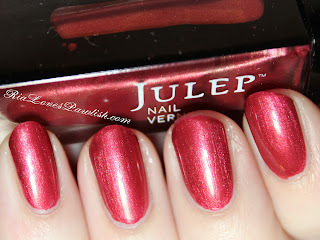 i think i'm finally getting used to the Julep formula, this is one easy peasy coat! one coat Seche Base, one coat Jodie, one coat Seche Vite.